The problem started off relatively minor, with just delays on southbound A and C trains around 8 a.m.
A trash fire that spread to the tracks at 145th Street crippled subway service during the height of the morning rush Monday, stranding thousands of riders from Brooklyn to Manhattan and prompting evacuations through smoke-filled train stations, according to the MTA and witnesses. 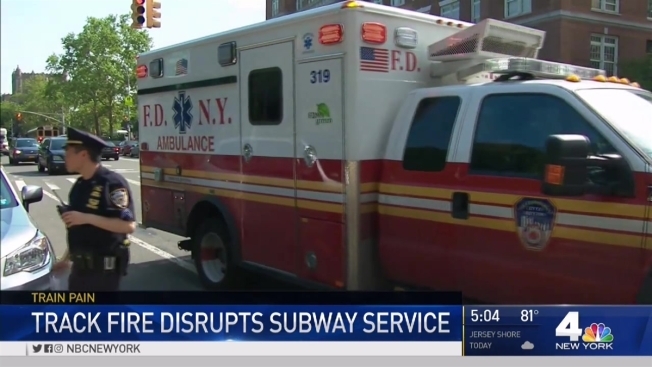 Hours later, subway riders faced more trouble across train lines during the evening commute because of signal problems, FDNY activity, a sick passenger and other issues. Nine people were injured in the fray that began around 7:30 a.m.; they were taken to hospitals in unknown condition and the specific nature of their injuries wasn't clear. Service on the B and C lines was completely shut down in both directions for two hours, as was A and D train service above 125th Street. The FDNY tweeted that the fire was under control about 90 minutes after it was first reported, and the MTA said shortly before 10 a.m. service on all the affected subway lines had resumed with extensive delays. The problems were initially confined to the A and C lines, but the issue quickly spread. Get real-time transit updates from all your key sources here. The power was turned off on some trains and several were evacuated. Twitter user Wendy Biddlecombe shared photo of her blacked out train at 145th Street. She said the train was evacuated in orderly fashion and no one was hurt. Video posted to social media showed fire trucks at virtually every corner of the intersection near St. Nicholas Avenue and West 145th Street. Twitter user Tamara Hansson said she and several hundred other commuters had to get off their train and walk to the No. 1 train as authorities investigated. "Literally a thousand people waiting at 1 train, and train just drove straight through - we are all gonna be late for work," she tweeted a short time later. Photos from the 168th Street No. 1 stop showed an ocean of riders flooding every part of the platform, stairs and track overpass. Subway riders who had gotten on a B train at DeKalb Avenue before the line was shut down were stuck on the Manhattan Bridge for 30 minutes. Photos showed riders holding their heads in their hands, desperately looking out windows. "MTA NYCT and emergency crews including the FDNY responded immediately and worked to restore service as quickly as possible," the MTA said in a statement. "As an alternative, customers were sent redirected to the 1 line which experienced heavy volume. We are reviewing the entire incident, we apologize for the inconvenience, and we appreciate our customers' patience." The agency says it has focused on reducing track fires with its aggressive TRACK SWEEP program that is being deployed system-wide. Riders continued to face headaches during the evening rush: a sick customer at West 4th Street-Washington Square briefly caused delays on the northbound C and E trains, and trains skipped some stations. Service has since resumed, but switch problems at Canal Street were continued to cause problems on the A, C and E lines. Some sort of FDNY activity at Lexington Avenue-63rd Street at 4 p.m. briefly caused F trains to run on the M line northbound and on the E line southbound, and then at 5:45 p.m., a train with mechanical problems at 57th Street delayed southbound F trains. Signal problems at Court Square also delayed 7 trains and caused crowding at Grand Central Terminal, photos posted to social media showed. Commuters also faced heavy delays on NJ Transit Monday morning. The Morris and Essex Line service was temporarily suspended in both directions between Chatham and Summit due to a trespasser fatality near Chatham. Service resumed after about an hour, around 7:45 a.m., with delays of up to 90 minutes both ways. The M&E Line was already subject to diversions and delayed commutes due to the summer rehab work at New York Penn Station. All but four daily trains on the line are being diverted to Hoboken.